FREE delivery to United Kingdom in 2 - 5 working days. Since 2016, the traditional table lamp providing reflected light is now also available in a small version. Perfectly faithful to the classic 1962 model, with a glass reflector,but with reduced dimensions and new colour choices. The Taccia table or floor lamp provides beautiful indirect and reflected light to create a soft ambience in any given space. Metal spinning aluminium reflector with gloss white finish inside and white powder-coated outside. Injection molded clear transparent plastic diffuser. Painted matte black or anodized silver extruded aluminium body. 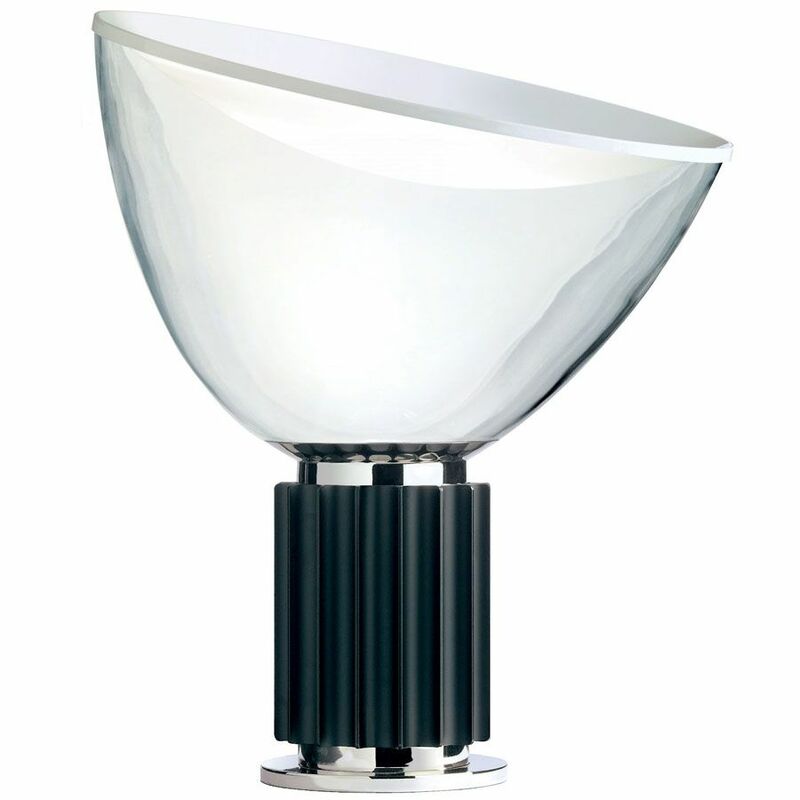 Nickel-plated protected with transparent paint, polished steel base. Power cord length 220 cm, with dimmer switch that provide ON-OFF functions and 10-100% light adjustment. Plug-in power supply with interchangeable plugs. He was born in Milan in 1918. As early as 1940 he dedicated himself to testing industrial production with brothers Livio (1911-1979) and Pier Giacomo (1913-1968). After graduating in architecture in 1944, he began research into shapes, techniques and new materials, aimed at developing an integral design process. He was one of the founders of ADI in 1956. In 1969, he was authorized by the Ministry of Education to teach "Artistic Design for Industry" and was a professor at Turin´s Faculty of Architecture until 1980 and then professor of "Industrial Design " in Milan until 1993. Since 1950 he has worked in the area of testing and research into outfittings and presentations for exhibitions (Triennale di Milano, Montecatini, Agip, Rai). MoMA in New York features 14 of his works. Other works can be found at:Victoria and Albert Museum (London), Kunstgewerbe Museum (Zurich), Staatliches Museum fur Angewandte Kunst (Munich), Museo del Design (Prato), Uneleckoprumyslove Prague Museum, Israel Museum (Jerusalem), The Denver Art Museum, Vitra Design Museum (Weil am Rhein), Angewandte Kunst Museum (Hamburg and Cologne). He staged a one-man show between 1984 and 1986 organized by the Museum fur Angewandte Kunst (Vienna), then at Akademie der Kunst (Berlin), Triennale di Milano (Milan), Kunstgewerbe Museum (Zurich), Haags Gemeentemuseum (the Hague), Circulo de Bellas Artes (Madrid) and at the Centre Georges Pompidou (Paris).